Another version of Maria’s Quilt! I have been learning such a lot through talking to quilters about my novel, The Forgotten Seamstress! 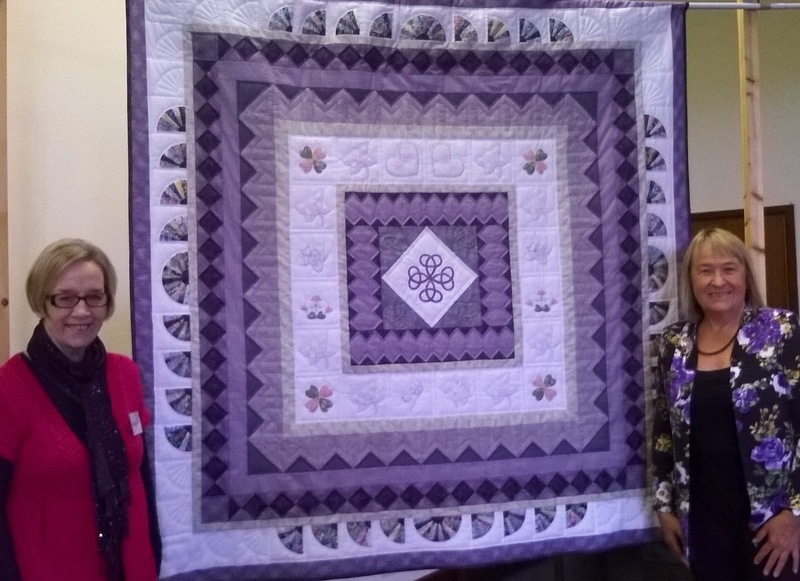 On Saturday I talked to a large audience for the Quilters Guild Region 8 Day, at Ipswich, and what made this day all the more special was the fact that quilter Judy Baker Rogers arrived with her version of Maria’s Quilt which was then duly hung for display, as a backdrop to my talk. Here she is on the left, with me on the right. The only thing missing for me was Lynne Edwards, my collaborator and the designer of the Maria’s Quilt pattern, who unfortunately had a prior teaching engagement (she’s so in demand!). I love the fact that quilters have such a broad interest in fabrics and their manufacture, as well as being fascinated by design, form, colour and all the rest. Judging by the numbers of copies of the book that they bought, they are also great readers! What a wonderful combination. Really enjoyed your talk on Saturday, Liz. Bought the book and finished it last night! Great, glad you enjoyed the talk – and hopefully the book! I just finished _The Last Telegram_ this morning. What a wonderful story wonderfully told! I was happy to find your website and discover that your next book is about quilts! Being a long-time quilter and an avid reader, I await that book’s arrival with double interest! … just an addenda to finish my “interrupted” reply. Thank you for your lovely comments about The Last Telegram. I hope you enjoy The Forgotten Seamstress (very different!) and if you are quilter do look at the finished versions of Maria’s Quilt which appear on my blog. And do let me know if you attempt the quilt yourself.